Well, so I have no shame to admit I don't remember ever beating a score that would give me an Activision patch back in the days, or perhaps I did, but I did not care to get the patch, or perhaps I cared, but did not send these patches to France. Anyway, I decided today to go on a quest, and to get some patches (well I initially said all, but come on..), using my ever expanding collection of carts. Turns out I miss many Activision games, so good excuse to spend time and money on eBay. If you don't know what these patches are, they were fabric patches, that you could get by beating certain score on Activision games. Apparently they would make you look cool on your jean jacket, next to the Ac/DC button and the peace and love sign. Very similar to the acheivements that you have everywhere today (gamificaiton of games.... Hooray for Activision) Link to AtariAge that explains a little more. So I had to pick game to start, I was hoping to find a list by order of difficulty, but couldn't so I tried at random a game that I always wanted to dive a little more into but never really had the time, Freeway. Similar to Frogger, but less known, maybe better, at least on Atari, you nee to help a chicken cross the freeway. And for whoever witnessed a chicken crossing a high traffic road, this has promises, a lot. So, quick look at the patch rules, I need to score 20 points on either game 3 or 7. I have no idea what are the differences between the games, typically, speed changes, and onscreen enemies change also. I went to game 3, and tried. And tried, and tried again. It took me about half an hour and I did it, I feel like I am on the top of the world, I score 20 points, and I am sure I can push this score by a little more if I had to. So this gives me the honer to send a picture of my screen to Activision (btw, back then w/o digital, how many kids took a picture , had to wait a week for it t be printed, then realized it was black, or the flash on the screen etc..). 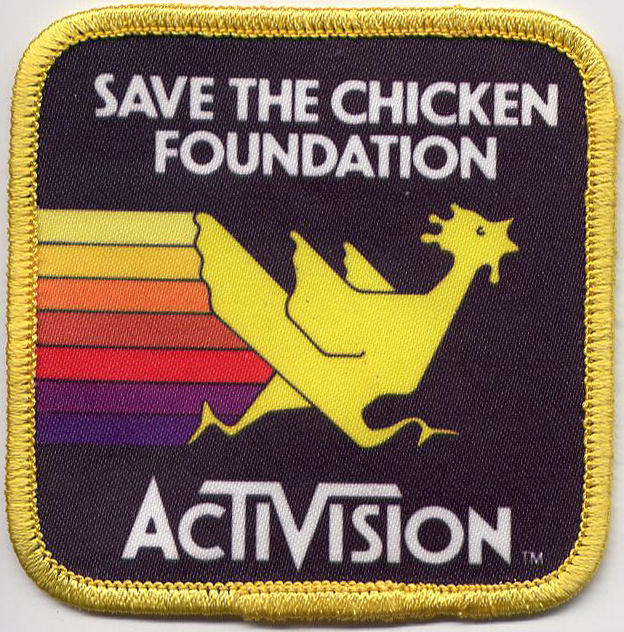 And supposedly, I should receive a save the chicken foundation patch. 20 points, freeway game 3.